Why did you want to become a firefighter? I wanted to become a firefighter because I believed it would be a challenging, physical job that has many different facets and is also extremely rewarding. I enjoy working within a team, in a dynamic environment where every day is different and you are constantly challenged and I knew that is what this job would provide. There are so many things to love about this job. It’s protecting and serving the community, which in itself is very satisfying and rewarding. It’s also the fact that no one day is ever the same, and you never know what your day is going to be like or what jobs you’re going to go to. The mate-ship and camaraderie on shift is another part of the job that is really enjoyable. It’s like having a second family, considering how much time you spend with each other and the things you do and go to, as well as doing a lot of stuff together on your days off. There are also many different areas for further development, so there’s always something you can be doing to challenge yourself and grow as a person and as a firefighter, from working with school children, to working with the building safety division, to undertaking a university degree. What advice would you have for someone wanting to apply to become a TFS firefighter? If you’re thinking about applying then my advice is don’t hesitate. If you’re passionate about helping the community, work well in a team, have a good level of fitness and are self-motivated then give it a go, you certainly won’t regret it. What would you say to someone who’s often wondered, but never applied to become a TFS firefighter? If you’ve often wondered but never applied, then I’d say check out this website. Read up on what we do and what it takes to become a firefighter. If you know someone who’s a firefighter then talk to them about it, and then apply at the next round of recruitment. It’s definitely a challenging process, and not everyone is successful on their first attempt, but it’s worth it if you want it because it’s the best job in the world! 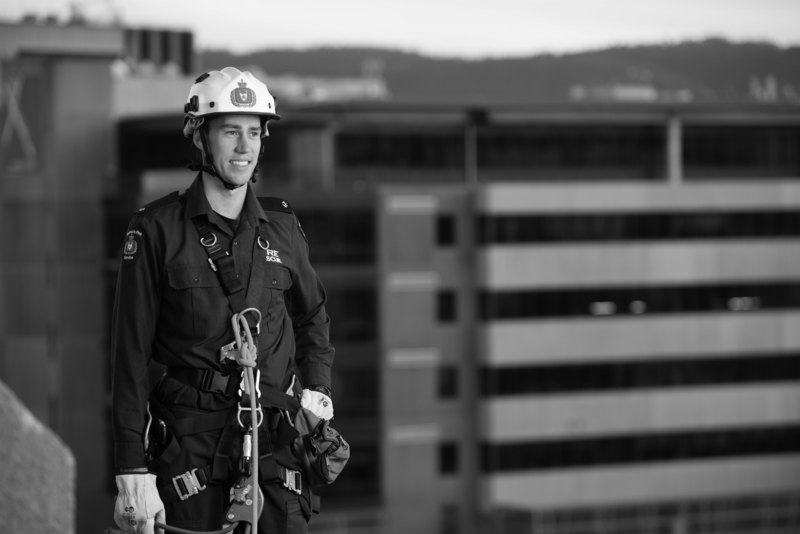 What career development opportunities are available to you as a firefighter? In terms of career development, there are many different opportunities available. After making it to the rank of Senior Firefighter, you can then make your way further through the ranks to Leading Firefighter, Station Officer, Senior Station Officer and so on. However even if you stay at Senior Firefighter rank, there are still opportunities to move sideways within the organisation, working in areas such as Bushfire Risk Unit, Community Fire Safety, Building Fire Safety, Planning & Capability, Community Education and much more. What are your future aspirations within the TFS? At the moment I’m focusing on my study and training for the rank of Senior Firefighter. Once I’ve completed that I’ll look to continue furthering my development and education in whichever ways I can, and possibly look at promotions further down the track in my career. It’s definitely a job for life so I’ve still got a long life as a firefighter ahead of me! How does the role fit with your lifestyle? The job fits really well with my lifestyle. We work two day shifts, two nights shifts and then four days off, so it offers a really good work/life balance and allows me to enjoy doing a lot of the things I enjoy outside of work, such as surfing, mountain bike riding, playing golf, fishing etc. Because we’re all like-minded individuals on shift, we’re all in to similar things so I’m quite often hanging out with guys on shift going riding or having a hit of golf or surfing. What career were you in before becoming a TFS firefighter? Before becoming a firefighter I was working as a deckhand on a crayfishing boat working out of the South coast and South West coast of Tassie. Before that I did an Exercise/Sport Science degree at Uni. Tasmania Fire Service - Now's your time.